These are the varieties of red open-pollinated (non-hybrid) tomato plants (some of which may be heirlooms) that we are offering. All plants are $1.50 each. Nepal, 78 days, indeterminate, 10-12 oz., beefsteak New! Deep red globes with good taste; excellent production through drought. Polar Baby, 60 days, determinate, ½"-1", cherry New! Produces small fruit very early on 1½'-tall vines. Prairie Fire, 50-55 days, determinate, 3-6 oz., slicer New! Abundantly produces very beautiful, smooth, globe-shaped fruit with small stem and blossom end scars. One of the best short season, cold weather tomatoes. Large-size, bright-red fruit; heavy yield and excellent flavor. An old variety that is now rare, it was introduced around 1930 by the USDA trying to perfect the most wilt-, disease- and rust-resistant tomato possible. Peter Henderson's catalog said in 1932, "For its disease-resistant qualities, it supersedes all others." They gave it high marks for flavor and yield, as well as perfect shape and attractiveness, saying, "undoubtedly it will occupy a leading place in market varieties." An excellent variety for the homestead. Purple Smudge, 75-79 days, indeterminate, 2-3 oz., fresh/juice New! A small, purplish/red tomato good for juicing or salads. Very productive. Red Calabash, 85 days, indeterminate, 2-3 oz., minibeefsteak New! A very scalloped miniature beefsteak; very prolific. Red Fig, 75-85 days, indeterminate, 1½"
Small, red fruit are pear-shaped. This heirloom dates back to the 1700's. It was offered by many seedsmen and was very popular for making "Tomato Figs." The fruit is sweet and tasty; the yield is heavy. Russian heirloom that sets fruit in cool conditions. Plants give heavy yields of bright-red fruit; introduced to the U.S. by O. T. Graham in 1964. This is the number one choice for juice or paste tomatoes for the home gardener. The plants produce a large crop of bright red, plum-shaped fruits. Can be canned whole or great for juice or tomato sauce. Russian 117, 90 days, indeterminate, 1-2 lb., oxheart New! Huge red oxheart; very good flavor; very productive. Good for canning, also good fresh; globe-shaped. Good yields and flavor; large vines. A fine New Jersey heirloom. Disease-resistant. Rutgers Select, 78 days, indeterminate, 6 oz. New! Mostly globes, later fruit can develop a small tip. Great full-bodied flavor. San Marzano, 80 days, indeterminate, 1" x 3", sauce/paste/canning/drying New! These large, rectangular tomatoes have thick, meaty red flesh with excellent flavor. The brilliant red fruits hang in large clusters and hold well on the vine or in storage. The high solids content of the fruits makes them ideal for canning. Also a favorite variety for making authentic Italian sauces and pastes and for drying. Siberia, 50 days, determinate, to 5 oz. New! An excellent cool weather variety that can set fruit at night temperatures as low as 38ºF. Small to medium-sized bright-red tomatoes are produced on a 2- to 2½-foot bush plant. Foliage is rounded, slightly curled and dark green. Delicious eaten fresh or for sauces and pastes. Silvery Fir Tree, 58 days, determinate, 2"-4", container New! Fernlike foliage; moderately seedy fruits. Unlike most tomatoes, this 2 ft. dwarf heirloom from Russia grows well in overcast coastal areas. Sioux, 75 days, indeterminate, medium, slicer New! Good for hot summer areas; excellent flavor. Smoky Mountain, 65-75 days, indeterminate, 4-6 oz., fresh/cooking New! Angora-type foliage; hexagonal globe-shaped fruit with very good flavor. Good for salads or cooking. Spring King, 60 days, determinate, 10-16 oz., slicer New! Big yield of very firm, globe-to-slightly-oblate tart fruit that are generally crack and blemish free. Good disease resistance. Most impressive in cooler areas. Super Beefsteak, 80 days, indeterminate, 1 lb+, beefsteak New! An improved beefsteak type with a bigger yield. Produces smooth, meaty fruits from midsummer to frost. Super Marmande, 70 days, semi-determinate, 5-7 oz., slicer New! This flavorful heirloom tomato is a long-time European favorite. Vigorous vines produce prolific crops of scarlet, beefsteak-style fruits. Fruits ripen even in cool weather, so they mature early and may be harvested late into the season. Delicious in salads and sandwiches. Super Sioux, 70 days, indeterminate, 4 oz. New! Old-fashioned tomato flavor in round, smooth fruits. Sets well under high temperatures. Sweet Million, 60 days, 1"-1½", cherry New! Vigorous plants bear large clusters of smooth, bright, miniature, sweet and tender, globe-shaped fruit all summer long. Resistant to Fusarium Wilt race 1, Nematodes, Tobacco Mosaic Virus, and Leafspot. Sweetie, 65 days, indeterminate, 1", cherry New! Deliciously sweet, bite-sized tomatoes can be used in salads or served on toothpicks as appetizers. Tall vines provide bountiful harvest all season. Beautiful, smooth, large, red fruit are globe-shaped. Superb for market growers, with good disease resistance, great yields, perfect shape, and wonderful flavor. This variety was developed by Merlyn and Mary Ann Neidens, longtime market and seed growers from IL. Bred from heirloom varieties so the taste is fantastic! A very rare tomato. Large, red, delicious fruit, and good yield. Rare and hard to find. The flavor is to be praised! Long/thin, flat, thick-skinned plum tomato. They taste good fresh; nice balance of flavors. Prolific producer. Italian heirloom. 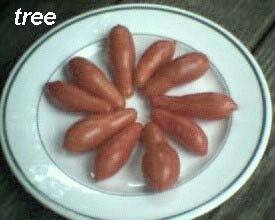 The Greek tomato that was introduced in the USA by Glecklers Seedsmen, of Metamora, Ohio, in the 1950's. It was a popular, large, red, uniform fruit with excellent flavor, high yields, and disease resistance. Perfect for home or market; keeps well. This is a long and skinny, very dry, paste-type tomato. Cut crosswise, it looks like a jalepeno pepper. Perfect for making paste or a thick sauce. Thin skin and walls. May be used whole while still green to make green tomato pickles.